Great-Great Grandfather Jonathan Foutz would probably agree with Dory — looking for answers to genealogy questions? Just keep sleuthing! Just keep sleuthing, just keep sleuthing…. Dory from Finding Nemo (and her own eponymous sequel) was really a genealogist at heart. The motto that kept her moving — swimming — kept leading her to families, no matter the leagues between them. First, Nemo’s, then happily, her own. Aside from occasional bursts of full-contact hereditary rummaging, my genealogical quest has been more of an occasional thing. Some early-a.m. flipping through old newspapers here, some peeks at the burgeoning pile of electronic detritus on Ancestry.com there. Day job, Dad duties, mindless TV — all conspire to slow my family-sleuthing from mad scramble to meandering marathon. And that’s OK. This blog is a record of where we’ve been before, and an open lane to the depths we’ve yet to discover. And often, the way to latch on to new currents is to back-paddle to places we last left off. Dive around. Pick up the tidal pull again. What do we do? We sleuth…. My goal for this space the next six months is to share, at least once a week, some tidbit or tale that I’ve kept under glass the last few years, or lately untangled from the historical net. These discoveries spark conversations, which in turn spark connections — people with answers, and questions of their own. Keep ’em coming. For now, here are five of the biggest, most-enduring mysteries I’d like one day to solve, bringing further clarity to the muddy waters of Foutz, Ley, Weible, Morgan, Fisher, Johnson, Palmer, Zeigler origins. 1. Where did Michael Pfouts come from? Yeah, we think we know. Württemberg. Along the lower Neckar River region in Germany. Where Foutzes of old farmed, fought, made little Foutzes. So says John Scott Davenport’s Foutz Newsletter of the 1980s: Michael Pfoutz emigrated to America in 1787, settled in Washington County, Maryland, and by 1810 or so was on his way to Harrison County, Ohio, where multiple records pretty definitively trace the Pfouts-Fouts-Foutz story through the succeeding two centuries. But: Where exactly did Michael come from in Germany? Why did he cross the ocean, at 18? Did anyone come with him? Where else did those possible brothers and sisters, and father and mother, end up? 2. What happened to Rachel Foutz? As traced in the years since an original summation of Foutz mysteries, we now know what became of every brother and sister of my great-grandfather, Vance Foutz, and even have a pretty good bead on their descendants, save for one sister, Rachel (Foutz) Coleman. They had at least four kids — Carl, who died of tuberculosis at my great-grandfather’s house in 1915 (same spring as Rebecca Foutz and her oldest son, Sherman); Blanche, Frank and Bessie. Bessie, born in 1906 in Dover, disappears, along with mother Rachel, from the record. No other census, death or burial records have been found. We later find William living in a veterans’ home in Canton, Ohio. And Frank lives until 1959 in Canton (he has a family I have not further explored – could be connections there). Meanwhile, sister Blanche lives until the ripe old age of 97, passing away in 1994 in Kent, Ohio. A few years back, I spoke to a family who knew her well, and shared photos. Story to come. But what became of Rachel? There’s a mystery even more vexing for all we’ve assembled about our now-distant Foutz relatives. Kaiserslautern Coat of Arms. The Leys emigrated there from The Netherlands sometime in the 1600s. 3. What can we learn of the Netherlands Leys? According to A Short History of the Ley Family, a pamphlet passed down from our Port Washington, Ohio Ley ancestors, the Ley family originated in the Netherlands and came to Kaiserslautern in Germany, probably in the late 1600s. 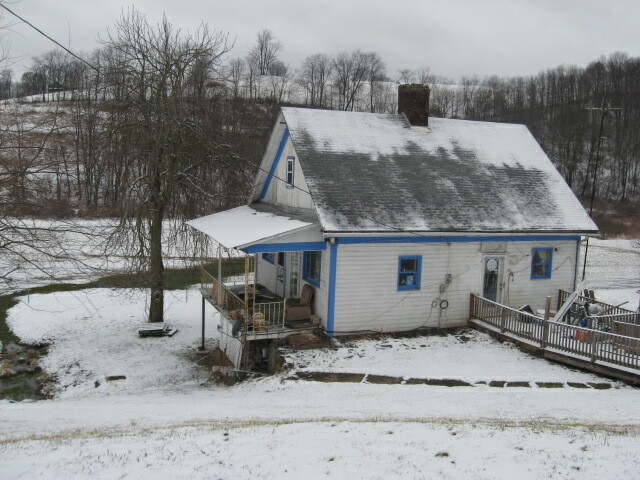 We can trace the family back through my fourth-great-grandfather, Karl Ley, coming to America in 1833 and settling first in Shanesville, Ohio, and later, Port Washington, making his career as a saddler. And then further back through his father, Frederick Charles Ley, a minister at the Evangelical Lutheran Church in Pfalz, Bavaria; and then through his father, John Frederick Ley, also pastor at that parish (succeeding, in fact, his father-in-law, who succeeded his own father). Neat trick, and probably an amazing place to visit someday for all that family mojo. What can we learn from detailed German records, which seem to have been maintained through the tenuous political jigsaw puzzle of those centuries, and through war, etc., but weren’t so far recorded by our relatives? Who were Thomas Johnson’s parents? We’ve got names, known to my grandma, Erma (Johnson) Foutz, and her sisters. Just not much else. Maybe because his name was so common? George Johnson was probably born in England, so says family legend, and he married a, well, Mary, and they settled in Guernsey County, Ohio. That’s the sum total of our knowledge about fourth-great-grandfather Johnson. We hear he was a mule skinner in the army — something to do with nabbing available meat from local farms the army passed through and butchering it for the fighting boys. But we don’t even know that much about the wife he left behind, Nancy Valentine, back home in Guernsey, at first, and then, by 1910 in Jackson, Ohio. There’s a tid bit about her maybe not getting his pension — why? We also don’t know her death. This is odd, because we know all their descendants, and their paths through Harrison and Tuscarawas counties, Ohio. Time to start sleuthing…. 5. Where, in Wales, were the Morgans? Also in the common name department are my second-great-grandparents, Thomas and Jannett (Rees) Morgan. We know their lives after they emigrated from Wales quite well — from their marriage in Philadelphia in 1872, to their settling in western Pennsylvania, and eventually, in Carnegie, where Thomas ran the Hotel Morgan before he died, in 1897. What is a continued vexation — a problem not cleared up by the terse obituaries of the 19th century — is just who their parents were. When Thomas first came over; when Janet did. What happened to their sisters and brothers (if they had any) and parents. Even how “Reese/Rhys/Rees” is spelled. We have theories about where they were from in Wales, and family stories of Jannett and her children going back to visit. 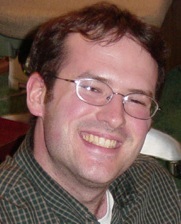 We’ve gained their photos, and a hunch about Jannett’s Dad’s name, Daniel. Everything else? Time to get sleuthing. For all the diapers and dandified prom pictures and PSAT prep and running-long recitals. The backyard football blood and the spring Saturday track meet sweat. The night-before science fair reports and the needlessly verbose detention polemics. The strep throat and fevers and incidental vomiting. The kisses and flowers and poems. And the blue-ribbon daughters-in-law, too. One measly day? HA. Mothers made us, and hence, for now and for all time, we declare every day, perhaps not tailor-made for them, but still, mothers’ days. Awhile back, I shared the newspaper account of the 1942 bridge card game at which my grandparents, Don and Erma Foutz, announced their engagement and pending early-morning May wedding. The article from our hometown Dover, Ohio Daily Reporter shared some great details of my grandparents at the time, including their employment, and paired with the engagement card that was in my parents’ possession, was a neat window on who they were as a newly-wedded couple. But there were — of course — some questions. For instance, cool on them for getting married at Grace Lutheran Church in Dover, where my dad and his brothers were confirmed, and where Grandma worshipped until her death in 2000. But why were they married at 6:45 a.m.? And was the picture above, which my wife and I featured prominently with those of our other grandparents at our wedding some 60 years later, really from that day, May 9? Could it have been, since Grandma is pictured in a suit, not a gown? And if no gown, was the rest of the ceremony more traditional, or matter-of-fact, hence the unusual time? Well, we don’t get all the details served up, the way we might in a conversation with them, could we ask. I say might, since memory and company have a way of shading some things, hiding others. But the official record, this time from the crosstown New Philadelphia Daily Times, fills in a lot of blanks. And helps confirm some cool pictures we have from that day as, yes, being genuine wedding-day shots. Of course, some errors in the account needed some extra research to untangle. See editor’s notes in the excerpt below. Spring and early morning combined to make the wedding of Miss Erma Johnson of this city and Mr. Donald Foutz of Dover a pretty affair today. Miss Johnson is the daughter of Mr. and Mrs. C. A. Johnson of New Philadelphia and Mr. Foutz’ parents are Mr. and Mrs. Vance Foutz of Dover. The two exchanged marriage vows this morning at seven o’clock in Emmanuel Lutheran Church (INCORRECT — Emmanuel was in Phila, but Pastor Ebert presided at Grace Lutheran Church in Dover) in Dover where two large white baskets of Madonna lilies and Star of Bethlehem were grouped at the altar. The Rev. Paul F. Ebert, pastor of the church, officiated for the ceremony, which was performed with Miss Margery Taylor of this city as maid of honor and Mr. Dale Andreas of Dover, best man. At six-forty-five o’clock, Miss Maxine Renner of Sugarcreek played a recital of organ numbers as a prelude to the marriage service and included in her selections “Ava Maria,” by Schubert; “The Rosary,” by Nevin, and “O Promise Me,” by de Koven. During the ceremony, Miss Renner played “I Love You Truly,” by Bond, and used “The Bridal Chorus,” from Lohengrin as the processional with Mendelssohn’s “Wedding March” as the recessional. With her smartly tailored brown and beige shepherd checked suit, the bride used dark brown accessories. At the shoulder she had a brown-throated white orchid. Miss Taylor’s becoming ensemble consisted of a beige suit with aqua and brown accessories. Her shoulder arrangement was of Johanna Hill roses. Miss Renner had a Briarcliff rose corsage. After the ceremony, members of the bridal party were served breakfast at the Johnson home. Mr. Foutz and his bride left for a short wedding trip and when they return, will reside for the time being in the Metz Apartments (by the location of Goshen Dairy in Phila today), this city. Mrs. Foutz was graduated in 1939 from New Philadelphia high school and is employed in the offices of Greer Steel Company in Dover. She is a member of Mu Chapter, Alpha Pi Sigma Sorority, of Dover. Mr. Foutz is a graduate of Dover high school, class of 1931 (incorrect – that was his final year of terrorizing Phila on the football field; he graduated in 1932), and is an employee of the Fred P. Potschner Garage in Dover. Don Foutz, probably on the day of his wedding, May 1942. 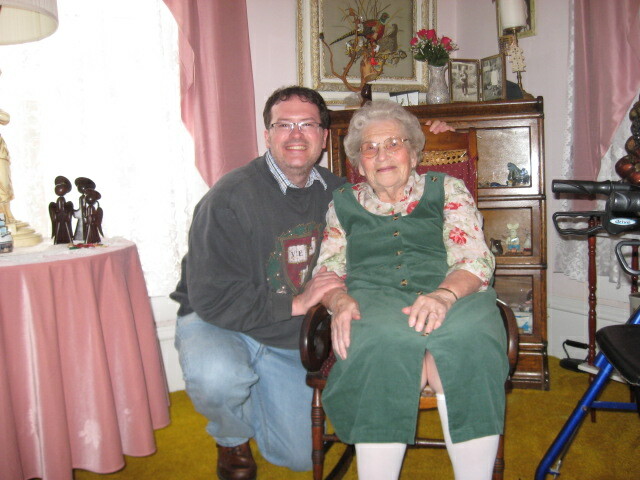 Prayers and hugs for the family of Great Aunt Nellie (Johnson) Fitzgerald, who passed away on Thursday, Nov. 19, 2015. Her house was always a site for extended family gatherings, full of stories and hugs and ample quantities of comfort food. She was the last surviving sibling in a family that numbered ten: seven brothers, three sisters. They knew hard times, hopping from house to house in the interval between wars. They knew personal tragedy in the loss of wives, brothers, daughters. They served their country and communities. They knit tightly with family and helped each other through. I know Nellie was particularly proud of making it to 99. I know we all wish she had made it a lot longer than that. And we’re proudest of knowing her. Below is a slide show of collected images from a life well-lived. And a copy of her obituary. Rest in peace, Aunt Nellie. Nellie Irene Fitzgerald, age 99, of Uhrichsville, O., passed away on Thursday, November 19, 2015, at Hennis Care Centre, following a lengthy illness. 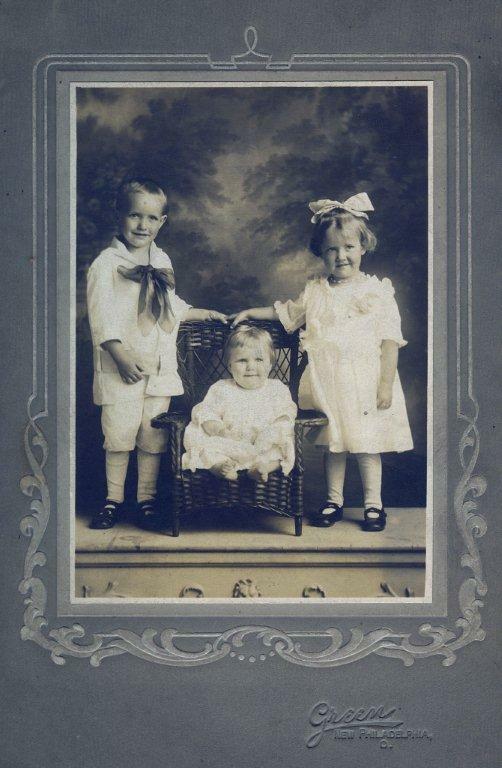 Born September 4, 1916, at New Philadelphia, Nellie was the daughter of the late Charles and Viola (Palmer) Johnson. 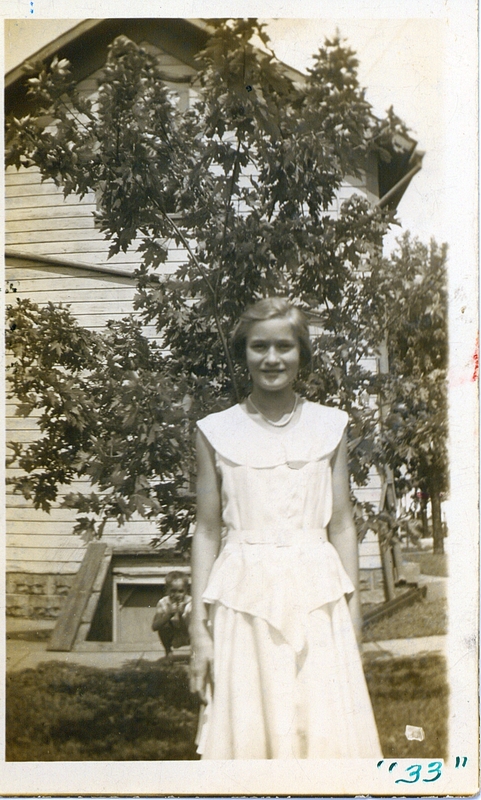 Nellie was a homemaker and a member of the Uhrichsville First Presbyterian Church. She was a 4-H advisor for 20 years, a Girl Scout Leader, volunteer at the Food Bank, Deacon of the First Presbyterian Church and a member of Homemaker of Union Township. In addition to her parents, Nellie was preceded in death by her husband DeLoyce P. Fitzgerald, who passed away on June 28, 1985; a daughter Rosann Fitzgerald Kohler; two sisters and 7 brothers. 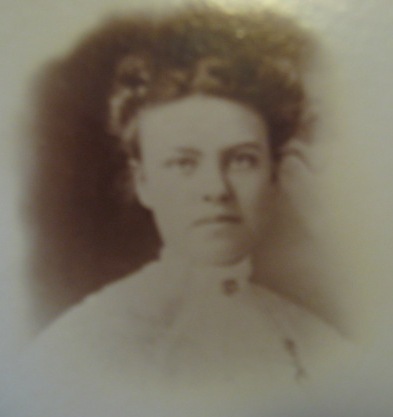 Nellie is survived by her son Jerry (Rose) Fitzgerald of Uhrichsville and daughter Sara Fitzgerald of Ocala, Florida; 4 grandchildren Pauline Kohler, Parrish (Sharon) Kohler, Katy Fitzgerald and Megan (Jason) McElory; 5 great grandchildren Amanda (Dustin) Martyn, Zachary Kohler, Josh Kohler, Emmitt McElory and Isaac McElroy; 2 great great grandchildren Harley Kohler and Bear Martyn. Funeral services for Nellie will be held at 1 p.m., on Monday, November 23, 2015 at Uhrich-Hostettler English Funeral Home, Inc. in Uhrichsville with the Rev. Mark Unrue officiating. Burial will follow at Evergreen Burial Park in New Philadelphia. Calling hours will be from 11 a.m. to 1 p.m., (two hours prior to services) on Monday, November 23, 2015 at the funeral home. Memorial contributions may be made to the Uhrichsville First Presbyterian Church, 633 N. Main St., Uhrichsville, O., 44683.